Whilst most of the attention during West Ham United’s first Premier League win of the season over Everton at Goodison Park on Sunday, was on the likes of Andriy Yarmolenko and Man of the Match Marko Arnautovic, there was another outstanding Hammers performer quietly going about his business. This man was club-record signing Felipe Anderson, who is one of a few players to have started each of the five league games so far, under Pellegrini, struggling at the beginning, but now starting to show his true quality. Anderson an ex-Brazilian International purchased from Serie A outfit Lazio for a fee totalling up to almost £50 million, played the full 90 minutes in his favoured wing position, out on the wide left. In the wake of the Irons’ first PL points under the experienced Chilean Pellegrini, we tactically analyse Anderson’s performance, finding out just how well he did play, while the likes of double goal-scorer Yarmolenko and last season’s Hammer of the Year Arnautovic, stole the headlines. 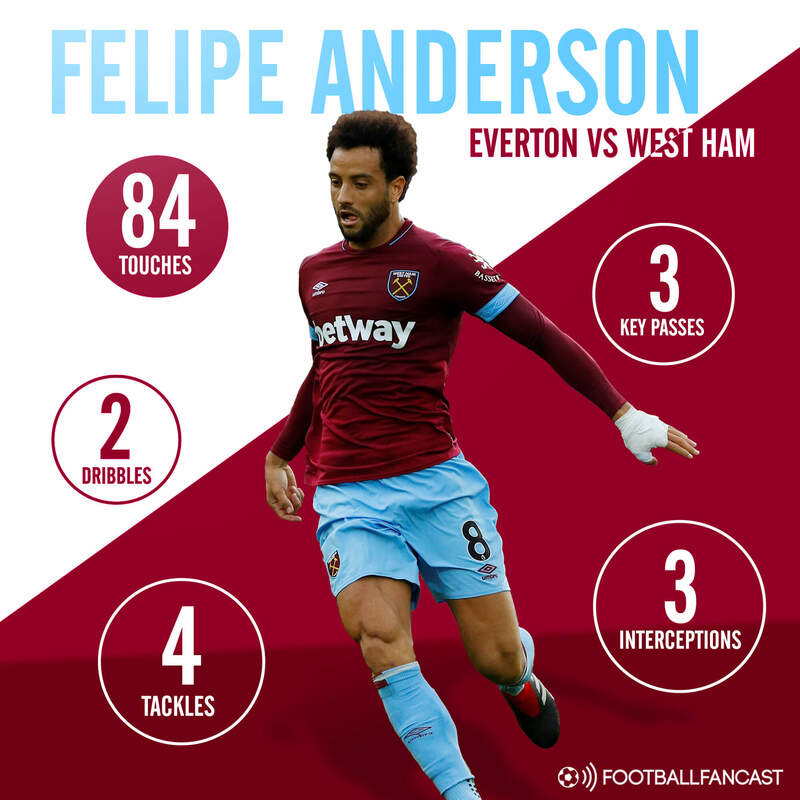 For the first phase of our tactical analysis, we have enlisted the help of our good friends over at footballfancast.com, who are one of our partners, to bring you the below graphic on Anderson’s showing. As you can see from the image, which includes five key statistics from his whole-match showing, the Brazil 2016 Olympic gold medallist managed an impressive 84 touches on Merseyside. That’s an average of nearly one touch per minute, many of which came in the attacking third of the pitch as the summer signing proved to be a constant threat down the left side, feeding the likes of Yarmolenko and Arnautovic with an endless stream of service. This is proved when we look at the next stat, his number of key passes, three, all of them causing problems to a youthful Everton defence, although none of them did lead to a goal, two dribbles, in addition, displays his attacking intent and desire to race forward. 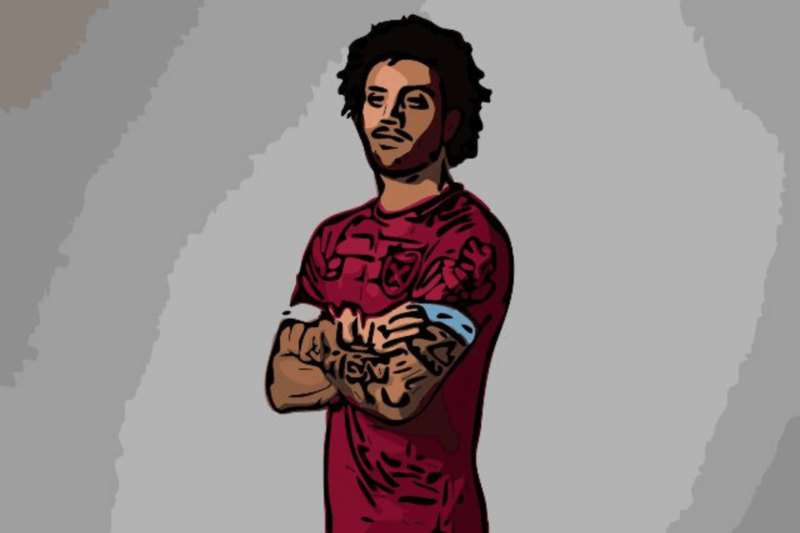 Our final two statistics show an entirely different dimension to Anderson’s play, his defensive side, important for any winger, especially when there is a more attack-minded full-back on the left flank, in the form of ex-Olympiacos star Arthur Masuaku. The paceman made a total of four tackles, stopping the Toffees from breaking down his wing and equally, also completed three interceptions in different areas of the pitch, winning the ball back, in order for the Irons to attack and protect their defensive backline. For the second part of our tactical analysis, with the help of our good friends over at whoscored.com, we have created a comparison between Anderson and his opposite number from Marco Silva’s side. This was England U21 International Dominic Calvert-Lewin, who was somewhat outshone by Anderson on the day, although, he far from brought his best form to a big home match. The above facts are evident in the fact that Anderson achieved a rating of 7.61 out of ten, compared to Calvert-Lewin’s 6.09, and also, was more ambitious going forward, having a go with one shot, meanwhile, the man playing left wing for the Blues didn’t have an attempt. The star in Claret & Blue, in addition, saw much, much more of the ball, as we can see from the graphic, enjoying an eye-catching 6.5 per cent possession, Calvert-Lewin’s share was a measly 2.2. Another impressive element of the 25-year-old’s performance was how rarely he lost the ball and how rarely his passes didn’t reach their targets, which we can see from his 75% pass completion, Calvert-Lewin couldn’t even reach 50%, in terms of his pass completion. The only two stats that Anderson’s opposite number has a higher figure in is dribbles, getting two more than his two, which we already know from the FFF graphic and number of times dispossessed, giving the ball up to an opposition player twice, a negative stat to have and something the Hammer only did once. Anderson comes out on top in the four tackles that we’ve already seen, Calvert-Lewin offering zero, and corners with one, albeit he is a more regular corner-taker than the Three Lions hopeful. The two players are even when we analyse the final stat we are going to look at, aerial duels, both Anderson and Calvert-Lewin won a single aerial duel, a strong figure for each as they are not specifically known for their capabilities in the air. Overall, as we have concluded from these stats, there could only be one winner when Anderson and Calvert-Lewin’s outings were compared, and it’s the Brazilian’s timid, but excellent display. 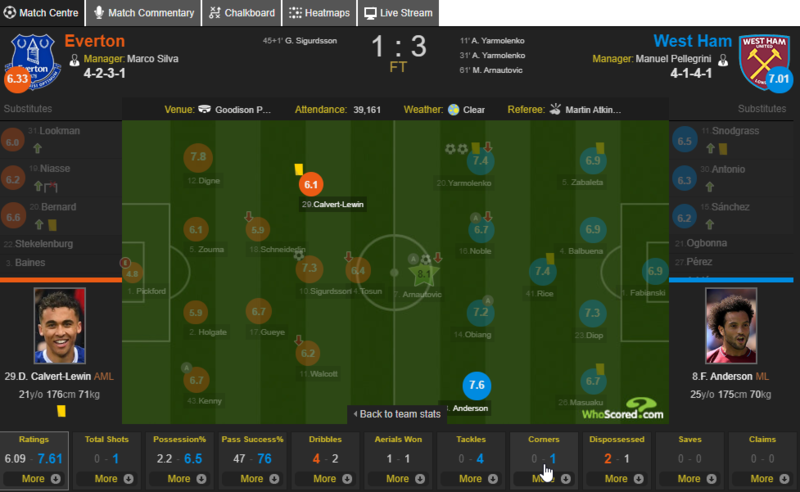 In conclusion, we can gather from our tactical analysis today that, despite not getting as much of post-match attention as some of the other West Ham attackers and the early-season criticism surrounding his transfer-window price tag, Anderson was one of Pellegrini’s best performers and a key part of a pivotal away win over the Toffees. From here, having built his form gradably over his first six competitive matches in Claret & Blue, Anderson will be very keen to push on and keep this kind of level of performance up, and also, that he is able to add a goal or an assist to this display, to merit more of the praise from the fans and media. Previous articleJust How Much Of A Miss Will Jack Wilshere Be To West Ham?